I may not always eat things that are particularly good for me, but I do try to achieve some kind of healthy balance in my diet--especially if I want to be able to eat all the foods I enjoy without having to buy new pants every couple of months. That means after a workout, I can enjoy a cheeseburger without any guilty feelings, and even put some bacon on it. Now that I’m running again, I try to eat more foods that give me energy and help me recover for the next workout. Smoothies make a great post run snack that will help your body refuel for the next time you exercise—wait too long to eat after a workout and you’ll find yourself crashing. It’ll also keep you from getting too hungry before your next meal and help prevent you from overeating. The last thing you want is for someone to find you standing in the kitchen cramming a fist full of cheese nips in your mouth like it was your last meal. That’s rock bottom. 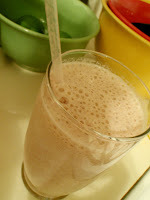 Good breakfast smoothie, or a snack that could pretend to be a milkshake. Good especially after a long run or lifting weights. Whey has about a hundred calories per serving (about 1 scoop, provided in the package) so if your trying to cut back on calories, lessen the amount. No explanation needed. Also good with vanilla whey instead of yogurt-- just add extra OJ. 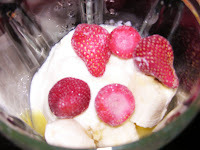 This one is not quite as low in calories, but definitely a rich and hearty smoothie for serious refueling. Mostly it just tastes good. *Flaxseed contains Omega 3 fats and fiber, and is said to be good for your immune system. Use it in small amounts because of its high fat content and make sure that the flaxseed is completely ground before consuming it or you won’t reap any of the benefits. In whole form it will just pass right through the body. It also adds a somewhat nutty flavor to whatever you put it in.